The best hummus is lusciously creamy yet somehow light and fluffy. It’s beautifully smooth and swirled, and begging to be scooped up onto a wedge of pita bread. It’s nutty and tangy, thanks to the tahini, with notes of bright, fresh lemon and mellow garlic. I encountered the most delicious hummus at Aladdin Cafe, a local Mediterranean restaurant. That hummus met all of the above characteristics, and I was hoping the owner might enlighten me with his techniques. When I asked, though, he replied, “It’s a secret,” with a sly smile and walked away. I went home determined to learn how to make magnificently creamy hummus. First, I took the fancy flavorings out of my other hummus recipes to make plain hummus. It was dense, a little gritty, and harshly garlicky. I was so disappointed. Next, I went to Google and opened up a million tabs to learn everything about hummus. You know me. Ten hummus attempts later, I’m ready to share all of my hummus tips and tricks with you. Get ready to make the best hummus of your life! 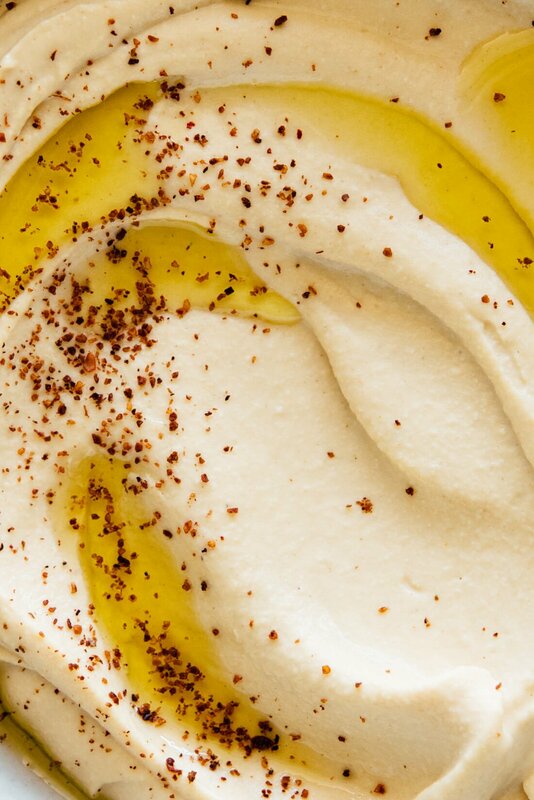 The internet at large raves that an Israeli chef named Michael Solomonov makes the very best hummus. It’s so good that Bon Appetit named his hummus their 2015 Dish of the Year. That’s some serious hummus. Solomonov’s secret? He uses chickpeas that have been cooked until they’re so tender, they’re mushy. Overcooked chickpeas seemed like a promising idea to me. You see, I once tried to make hummus with canned chickpeas that were oddly undercooked, and they made terrible hummus. No matter how long I blended the hummus, those undercooked chickpeas never blended into creamy oblivion. Plus, baking soda helps break down the chickpea skins, which means you do not need to peel off the skins individually. Who has time for that?! I bet you don’t have time to soak your chickpeas overnight and cook them from scratch like Solomonov, either. Here’s my time-saving solution: Just boil canned or leftover cooked chickpeas with baking soda for twenty minutes. You can see the difference that baking soda makes in the photo below. See how the chickpeas on the right are popping open more? They are significantly softer in texture as well. The chickpeas are ready to go after a quick rinse under cool running water, which rinses off the baking soda flavor and cools the chickpeas so your hummus doesn’t develop a weird outer film. Are you as excited about this as I am? You can have this incredible hummus now-ish, not tomorrow! No chickpea peeling required. I have a few more tips and techniques to making great hummus, so read on or scroll down for the full recipe and variations. Cook canned or leftover cooked chickpeas according to step 1 below. 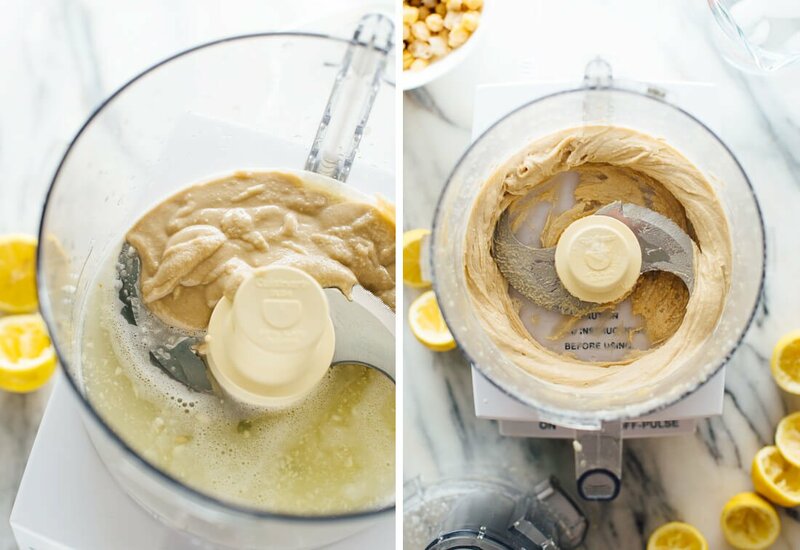 This only adds 20 minutes to your hummus-making time, and it’s my number one tip for making perfect hummus at home. 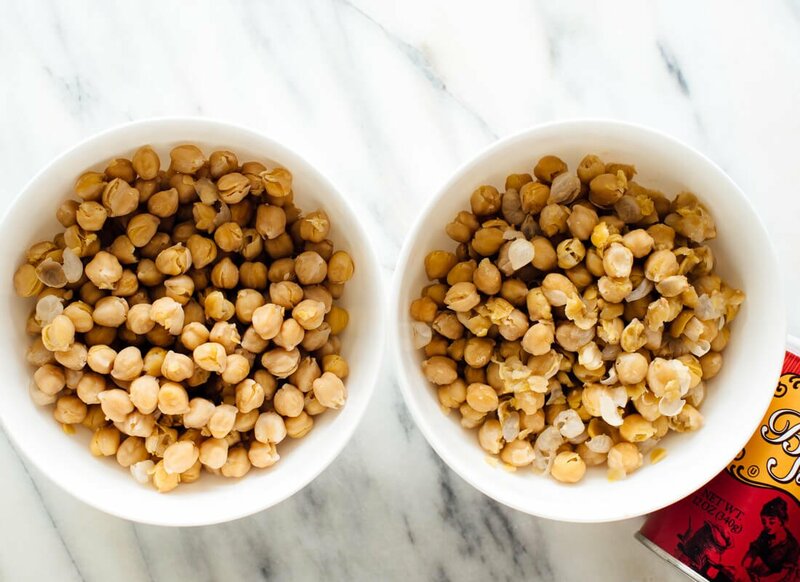 Want to cook your chickpeas from scratch? You sure can—see the recipe notes. 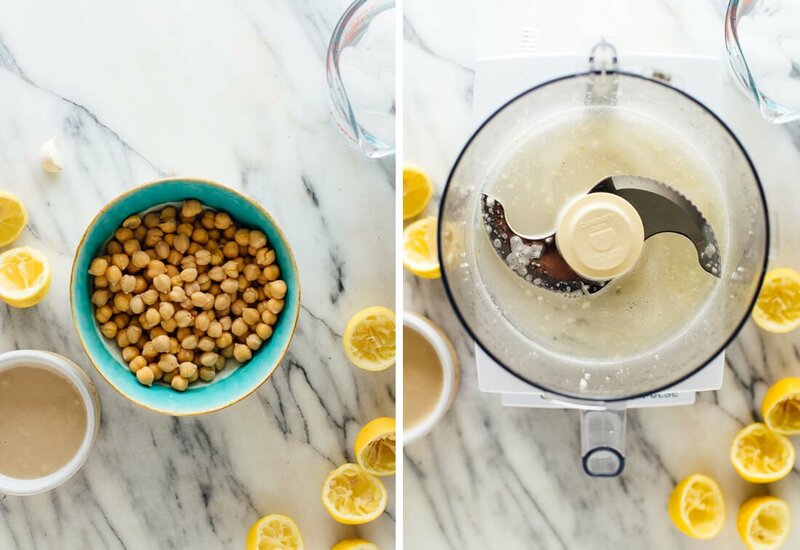 Can you over-cook your chickpeas in an Instant Pot? I don’t recommend it—you’ll end up with a mess of chickpea mash clogging your vent and a puddle of chickpea cooking water surrounding your Instant Pot. I speak from experience. All tahini is not created equally. When I was in Israel, Israelis’s spoke of tahini, or “t’hina,” with reverence. I learned that the best tahini comes from Ethiopia. Store-bought tahini in the U.S. varies widely in flavor, with some of them so bad that they’ve ruined my hummus. My favorite brands of tahini? I had to try Solomonov’s favorite, Soom. I found it on Amazon (affiliate link) and I have to say that it is worth it. Second favorite? Trader Joe’s organic tahini, which is made from Ethiopian sesame seeds like Soom’s. Whole Foods 365 used to be my go-to, but I encountered a few bad jars that tasted so bad, I’m afraid to try again. Don’t skimp on the tahini, either—you need to use 1/2 cup tahini per can of chickpeas for rich and irresistible hummus. I once toured an enormous hummus production facility and learned that they often reduce the cost of producing store-bought hummus by using less tahini. Sneaky! Why do you always want to mix ice-cold water with tahini? This is another trick that I learned on my trip. I can’t find a scientific explanation, but it seems to help make the hummus light and fluffy, and lightens the color of the tahini to a pale ivory color. Store-bought lemon juice always tastes stale and sad, and it will make your hummus taste stale and sad. Buy lemons and your humus will taste fresh and delicious. I almost always add another tablespoon of lemon juice to my hummus for extra flavor before I plate it, but I’ll leave the tang factor up to you. This is another trick from Solomonov—if you mince the garlic in the food processor or blender with the lemon juice and let that mixture rest for a few minutes, the garlic will lose its harsh, raw bite and mellow out. I tried it before and after, and he’s right! Here’s Serious Eats’ scientific explanation for why this works. 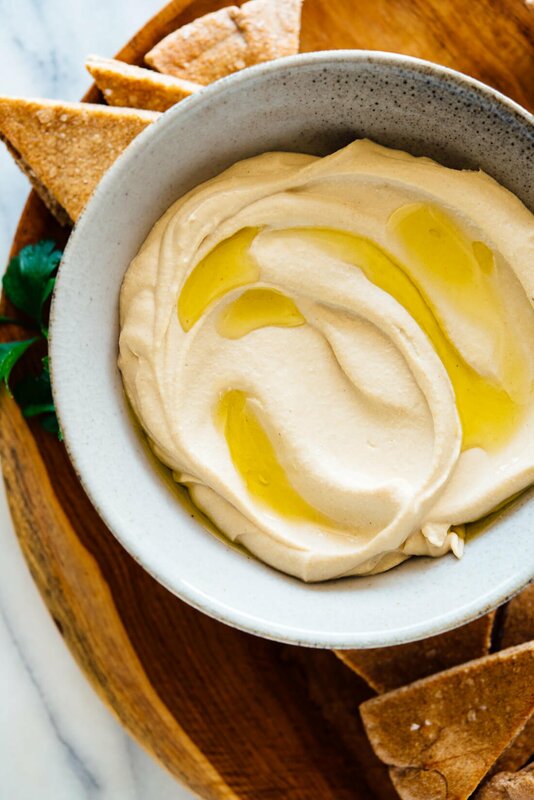 Solomonov doesn’t blend any olive oil into his hummus, but I think that one tablespoon makes the hummus taste even more luxurious and creamy. I recommend it! The cumin is subtle and offers some “Je ne sais quoi,” if you will. It’s a common ingredient in plain hummus recipes, and makes the hummus taste a little more special. 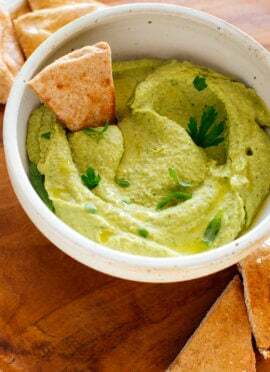 This hummus recipe is plain (and by plain, I mean delicious), but you can blend any of the following in with the chickpeas to make variations. Ok, let’s make some hummus! I’m dying to hear how this hummus turns out for you. Please let me know in the comments and tell me if overcooking your chickpeas makes all the difference! You can also share a photo of your results on Instagram with the hashtag #cookieandkate so we can all see your results. 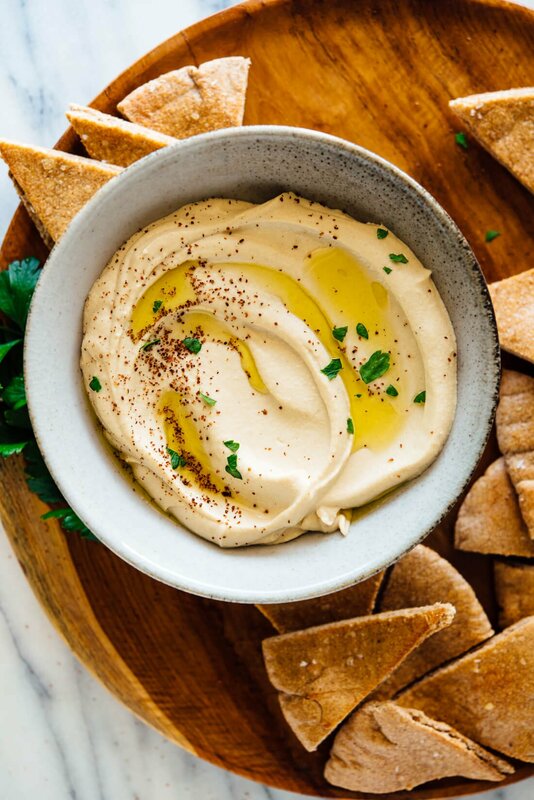 Learn how to make the best homemade hummus! It’s creamy, dreamy and light. This hummus recipe is easy to make—no peeling chickpeas or overnight soak required. Recipe yields about 2 cups. Place the chickpeas in a medium saucepan and add the baking soda. Cover the chickpeas by several inches of water, then bring the mixture to a boil over high heat. Continue boiling, reducing heat if necessary to prevent overflow, for about 20 minutes, or until the chickpeas look bloated, their skins are falling off, and they’re quite soft. In a fine-mesh strainer, drain the chickpeas and run cool water over them for about 30 seconds. Set aside (no need to peel the chickpeas for this recipe!). Meanwhile, in a food processor or high-powered blender, combine the lemon juice, garlic and salt. Process until the garlic is very finely chopped, then let the mixture rest so the garlic flavor can mellow, ideally 10 minutes or longer. 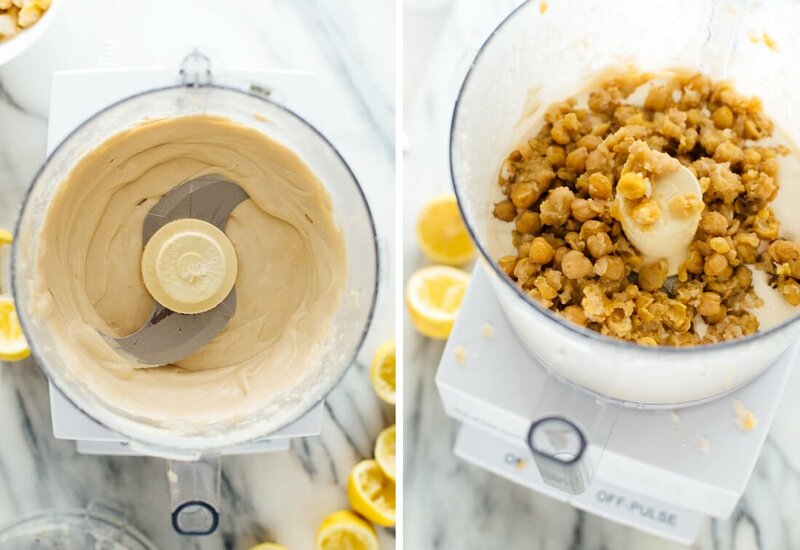 Add the tahini to the food processor and blend until the mixture is thick and creamy, stopping to scrape down any tahini stuck to the sides and bottom of the processor as necessary. Add the cumin and the drained, over-cooked chickpeas to the food processor. While blending, drizzle in the olive oil. Blend until the mixture is super smooth, scraping down the sides of the processor as necessary, about 2 minutes. Add more ice water by the tablespoon if necessary to achieve a super creamy texture. Taste, and adjust as necessary—I almost always add another ¼ teaspoon salt for more overall flavor and another tablespoon of lemon juice for extra zing. Scrape the hummus into a serving bowl or platter, and use a spoon to create nice swooshes on top. Top with garnishes of your choice, and serve. Leftover hummus keeps well in the refrigerator, covered, for up to 1 week. Recipe adapted from Michael Solomonov, via The New York Times and Bon Appetit, and Yotam Ottolenghi. 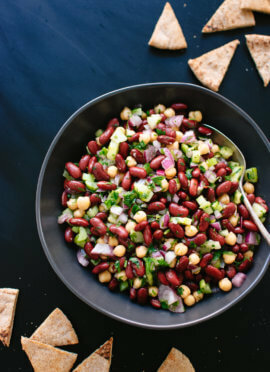 How to cook dry chickpeas in a hurry for this recipe: In a large saucepan, combine 5 ounces (¾ cup) dried chickpeas and ½ teaspoon baking soda, and fill the pot with water. Bring the mixture to a boil over high heat and skim off the surface foam as needed. Continue boiling over medium-high, adding more water if you start running out, until the chickpeas are very mushy and falling apart, about 1 hour to 1 hour 15 minutes. Drain in a fine-mesh colander, rinse under cool running water, and drain well before using. Start the recipe at step 2. I’m in the U.S. and we are the odd ones who don’t use the traditional metric system. Sorry! This was the best hummus I’ve ever had. Thank you so much for a wonderful recipe of one of my favorite foods! I love it, Becky! Thanks for your review. This is hands down the best hummus recipe I’ve ever used. Soooo smooth and creamy! Ps I love that you used cups instead of grams. I’ve made hummus a few times from a few different recipes. Never better than store bought which is disappointing. This recipe is fantastic!!! 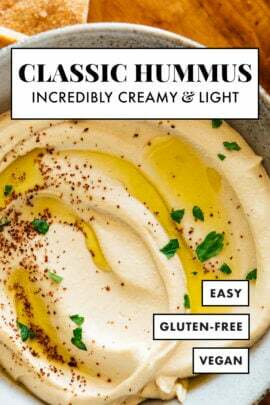 I used the TJ tahini which was very mild, I thought for sure the hummus wouldn’t be very good but wow, you’re right, this tahini is good and it makes a big difference. I added 3/4 tbsp more olive oil and I loved it. I will never go back to store bought, I’m so excited to have this recipe! I’m excited you liked this one, Michelle! Thank you for your review. My daughter loves hummus and I would like to be able to send it in her school lunch, but we can’t pack anything with chickpeas or sesame due to her classmates’ food allergies. Any suggestions for a chickpea- and tahini-free hummus? Baba ganoush gets closer but would still need something to sub for tahini. Thanks!! This comment is a reply for Laura’s question…I saw a recipe that used pinto beans, instead of chickpeas, to make falafel. I didn’t try it, but I bet it might work in this recipe. I read that Tahini could be substituted by sunflower seed butter. Good luck with your recipe. I hope it comes out great! P.S. We made the hummus recipe with no changes and it was fantastic!!! Pick Up Limes has an edemame and sweet pea hummus. If there are soy allergies, maybe you can try just using sweet peas and no edemame which is what I am going to do. Instead of the tahini in the recipe, try sunflower seed butter? Hi Laura! That is a conundrum, and I’m really not sure about making hummus without those two key ingredients. If you’re open to other options that are similarly creamy/tangy, maybe she would enjoy tzatziki or creamy avocado dip? Hope that helps somehow! Thank you everyone for your replies! I’ll give some of these a try (actually already tried the tzatsiki this week and it is awesome)! This is the bomb! I doubled the recipe, topped it with black olives and evoo. We are eating it warm, and it’s fabulous. Thank you for all of the great tips! Can’t wait to try varieties! This recipe turned out great! Thanks. I ran to TJ’s to get their organic tahini and it’s actually from Greece, not Ethiopia. It didn’t make a difference as far as I’m concerned, still came out delicious! I’m glad it turned out so well! Thank you for sharing, Kristine. I’ve made this recipe many times, of all the other recipes I’ve made, this is my absolute favorite, so silky and smooth. Great to hear, Susana! Thank you for your review. What is this left over hummus you speak of? Best recipe I have used. The addition of the soda is genius Houston we have a keeper!!! I love that! It usually doesn’t last long for me either. Thank you for your review! This was delicious! Thank you for taking the time to figure it out for us. I was only able to find Kronos Tahini, but it still turned out beautifully. You’re welcome, Jeni! Thank you for your review. First time I ever made hummus at home and it turned out so so so perfectly. Thanks a lot for this recipe, we all really enjoyed it. Even the plain version is already so good! Love to hear that, Victoria! Thank you for your review. You´re absolutely right – the verry best humus I´ve ever eaten! And yes, the quality of the tahina is essential. Didn´t have paprika but garnished w´ some crushed, smoked, hot chillis from Mexico (chile morita). The bite, as does the cumin, gives it an extra kick. Can´t thank you enough for this recipe – a real winner. I’m happy you agree it’s the best, Kn! If you could like to leave a star review, I would really appreciate it! I have tried soooo many different hummus recipes that didn’t quite make it that I gave up trying. They all lacked “something” even though I experimented many, many times…. This recipe can truly be labelled THE BEST!! It’s super smooth (fab trick to cook the chickpeas again) but more importantly for me, the taste balance is perfect. In fact, everything is perfect!! I did use one trick I saw on another recipe….instead of ice water I use the juice of the canned chickpeas that I super cool in the fridge. Hooray!! I’m glad this one was able to meet your expectations and you found that “something.” Thanks, Denise! Just made this! It’s so smooth and delicious! I’ve been looking for a recipe that’s not gritty and this is the one…thank you! You’re welcome, Chris! Thank you for your comment. I’d tried making hummus with other recipes but it was just never ‘right’. I’m so happy to have tried your recipe…wow, your recipe and technique made it incredible!! This was soooooo good and I’ll never need to order take out again :) Thanks so much for sharing a great recipe! Hooray! Love to hear this, Heather. Thanks for your review! Oh my god, this recipe is so good. 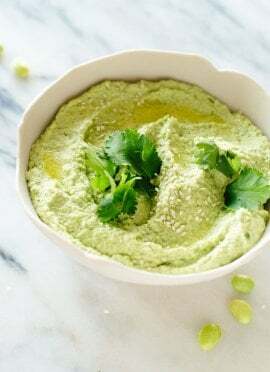 I am a huge hummus fan and this is hands down, one of the best hummus recipes I have made. Highly recommend, it isn’t too full on so would be suitable for those who aren’t a huge fan of garlic. I’m excited it meets your standards, Isabelle! Thank you for your feedback. I had never made hummus before and chose this recipe for all of the positive reviews. I made it today, and I don’t think I’ll ever need to try another recipe. This one is just perfect. 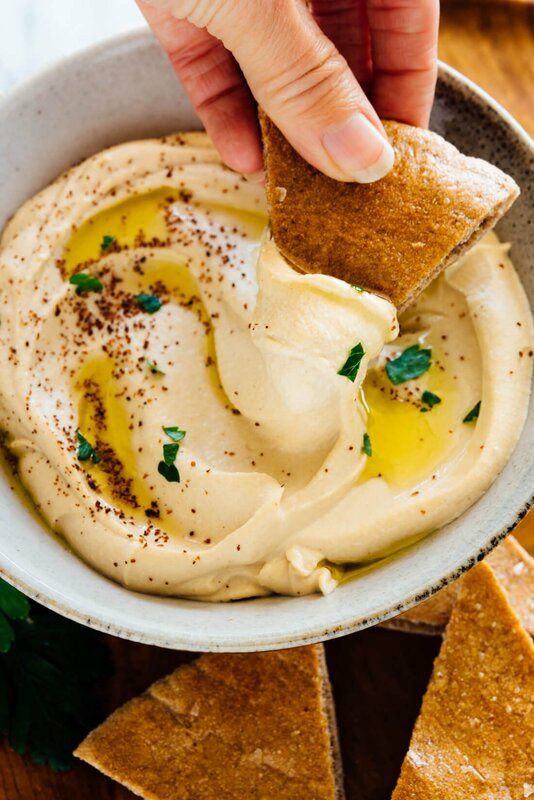 The texture is light and airy, and the hummus is flavorful but versatile. Thank you, Leah! I appreciate you trying it and letting me know what you thought. This is a great recipe! The key is to cook the beans. I had on hand some roasted red pepper and eggplant appetizer spread and added some…very tasty! Next time, I’ll try roasted garlic. Yummy! Made a double batch – can this be frozen? I don’t think this would freeze well, but I could be wrong! Let me know if you try it. Made this yesterday and it is the best hummus I’ve tried. I started with dried chickpeas because I had extras from making a curry the day before. So creamy and delicious. Definitely will make again. Perhaps half edamame next time to increase protein since this was so good I wanted to eat it with a spoon. We loved this hummus at my house! My two year old just wanted to eat his with a spoon! That’s amazing, Gillian! Thank you for your review. Oh my gosh this hummus is SOOO good. We went to Israel 2 years ago and this is as close as you can get to what we had there. Well worth the little extra effort. That is a huge compliment, thank you!! YUM!!! After being scared to make hummus, I finally made your recipe last night and brought it to work with some fresh veggies. It was a hit! Ended up forwarding your recipe a couple times when I told them how easy it was. I added a bit too much water but it was still SO good and creamy. Thank you! I’m so happy you liked it and that it was such a hit! Amazing hummus recipe! Can’t wait to try flavor variations. So glad I stumbled upon it. Thank you! Loved your hummus recipe! Did you pick the skins out before putting the chickpeas in the processor? I added a couple tablespoons of picked jalapeño for a little kick. Not need to peel the skins for this one! That’s another reason it is the best. Thank you for sharing this recipe and for writing such clear, easy-to-follow instructions! We just made it and it has a wonderful warm flavor that homemade hummus often doesn’t have. It’s so delicious and has a wonderful texture! When do you add the chick peas to the processor? Or did I just miss that part? The best recipe for hummus! Better than any store bought. I make it all the time. Sometimes I even add black olives to give it a different flavour. Thank you for sharing your take, Paige! You’re welcome! I’m so happy you love it. It’s not even out of the food processor and I can’t stop eating it!!! My daughter loves boars head hummus and I told her I could do better. Thank you for letting me live up to my words. Thumbs up from a picky 9 yo. I love that! So good it doesn’t make it beyond the food processor. Buy your Soon Tahini directly from Soon foods off their website. They don’t charge shippin. That way Amazon doesn’t gouge then 15%. Their price is comparable and you get a discount if you subscribe. No need! Just run them under the cool water when you are done – see later part step 1. Best hummus i have ever made. Hooray! I love hearing that. Thank you for sharing, Maria. We had a “Mediterranean Magic” Dinner Party. I made your recipe The Best Hummus. Everyone LOVED the dish. I served it with raw carrots and pita bread. I loved your step by step explanations with pictures. I followed it without deviation. It was perfect…. so clear and precise!!!!!! Thanks for making my dish (your dish) a hit!!! I’m glad you loved it! I love the sound of the dinner party, too. Thanks, Didi! Made it, Loved it. Am making it again right now. All my friends loved it also. Thank you for great recipe. You’re welcome, Pam! I’m so glad you love it. Best recipe I’ve tried. Love it! Thank you! I used your recipe and really like how my hummus turned out!! You’re welcome, Jennifer! Thanks for your review. You are so right about the cumin! I forgot this key ingredient for few weeks and OMG this makes all the difference. I couldn’t remember what was missing! I was wondering, if we cook the chickpeas for a long time like you recommend, willl it kill all the nutritional goodness? Right! So good. I think a lot will remain and still really great for you! I don’t have the specific breakdown outside of what is in the nutritional information, sorry! I’m glad you found it and loved it, Danielle! Thanks so much for the tip about softening the chickpeas more with the baking soda and extra cooking time. 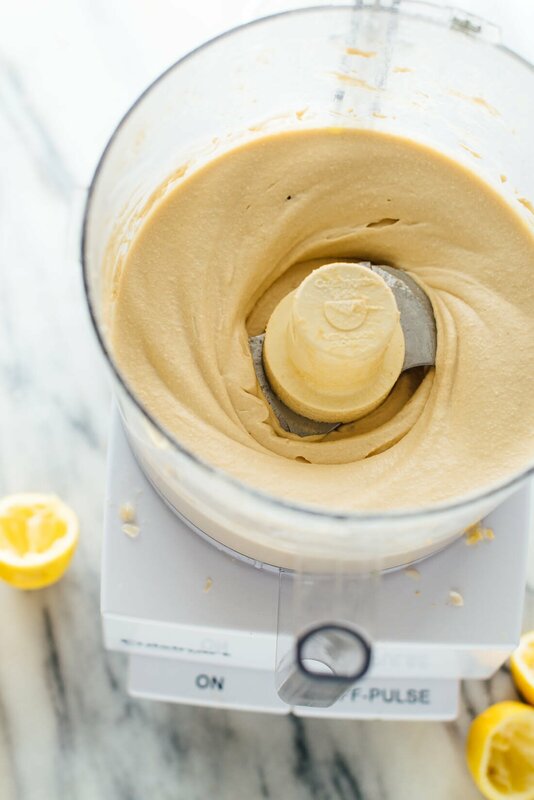 My hummus is finally creamy–even in my so-so blender! I didn’t add as much tahini as the recipe called for since we’re having to watch the fat (unfortunately! ), but it still turned out very yummy. Thanks again! Gross. Way too much tahini. I’m sorry you didn’t love this one. Thanks for sharing! I have made great hummus for years, but this is the best. Thank you. Now to try the variations!! I am getting ingredients together to try this, and have a question….if I use my Instant Pot to cook the chick peas till done, then I will need to transfer and cook them further in a sauce pan till mushy, right? Since they are not canned, they do not need baking soda? Just making sure I understand the instructions! I made this tonight! Took your advice and drove to Trader Joe’s to get organic tahini. Oh my, this is delicious! My gluten-free (celiac) daughter enjoyed it, and my husband and I ate it with Tandoori Naan bread. Served along with avocado,brown rice, black bean, Lime juice “salsa” and blue corn chips. A nice meat free dinner. Will make this again! I’m glad you all loved it! Thanks for sharing, Amy. Outstanding! When I pass along a recipe to my daughters, well, you know it’s gotta be good because I rarely do that unless it’s fabulous. This recipe IS. Hands down the best I have ever made or had. For those who shy away from hummus because they’ve only had the gritty, sour stuff…I hope they try this. Game changer. Thanks!! Mine did not come out as smooth as yours looks in the pictures. My chick peas were definitely opened up. How long did you boil them for and then blend in the food processor? 20 minutes boil, 2 minutes blend. Finally!! I swear I’ve tried every hummus recipe on the internet and am always somewhat disappointed. Not this time…this is the creamiest, most delicious hummus I’ve ever made! Now I can ditch all the other recipes and just use this one. Thank you! This recipe is so fantastic and super easy. Store bought is so gross to me after making this recipe! I am currently doubling this batch for a party and it’s sure to be a hit! Love to hear that, Brooke! Thanks so much for your review. I hope the party was a blast! You’re welcome, Lisa! I’m glad it will be a new favorite for you. As I’m in Canada (no Trader Joe’s), I looked for sources of Soom tahini, and discovered that several batches had been recalled for possible salmonella contamination (http://www.inspection.gc.ca/about-the-cfia/newsroom/food-recall-warnings/complete-listing/2018-11-29/eng/1543538084410/1543538086119). Makes me a bit leery about buying it. Any other recommendations? Hi Victoria! Thanks for sharing and I’m sorry to hear there is some contaminated. That’s a bummer. Although not my favorite currently(per post), Whole Foods brand would work here too. Thank you, Angela! I’m so glad you loved it. WOW Kate, you are serious about your hummus, girl!!! Thank you for your commitment and research. I’m glad you love it, Jenni! Thanks for your review. I’m glad it meets your standards, Mansi! Thanks for your review. Yum! Will make this again and again. No more soy for me! Made original recipe and will experiment next time with add ins. Thank you for ALL your great recipes! Making my life easier!